This is one of the recipes I think of as “refrigerator creations,” because so many of my one-dish meals are born out the fact that I had a few random things lounging around in my fridge, and when I tossed them all together they turned out to be so scrumptious. And usually these are not ingredients that I would have planned ahead to combine – it is almost always all sheer luck and circumstance – but in the end they transform themselves into something I would make again and again. Life can be like that in many ways, and more on that later. In the meantime, here’s how some leftover chicken, a bottle of my favorite ranch dressing, a package of artichokes I found in the freezer and a few other things turned into my current favorite one bowl dinner…let’s make it!But first, here’s a fun little story of luck and circumstance in the non-food end of my life. 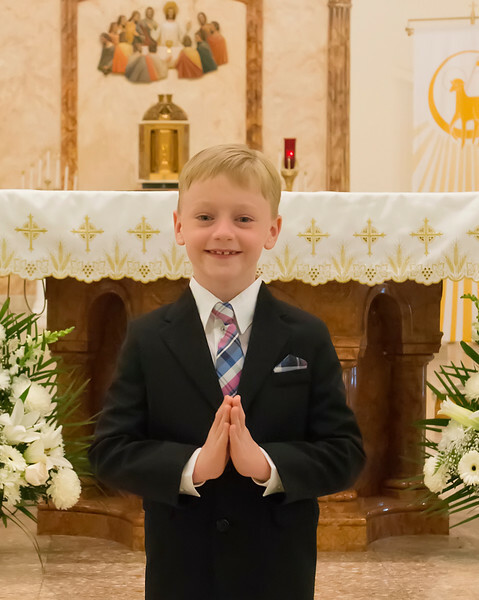 This past weekend, my sweet little nephew, who is growing up WAY too fast, made his First Holy Communion. I mean, really. THAT FACE. After church, we all went to Blackjack Mulligan’s to celebrate The Day, because we Irish know how to have a good time when it comes important life events, and that is by going to an Irish establishment and letting the good times roll. In this case, we were celebrating with everyone from the proud grandparents all the way down to wee red-haired baby Kathleen, and with a lot of these sized characters in between. Here comes the luck and circumstance part. Because there was a lot of family around all in one place, I jumped in as Official Photographer to document the day. 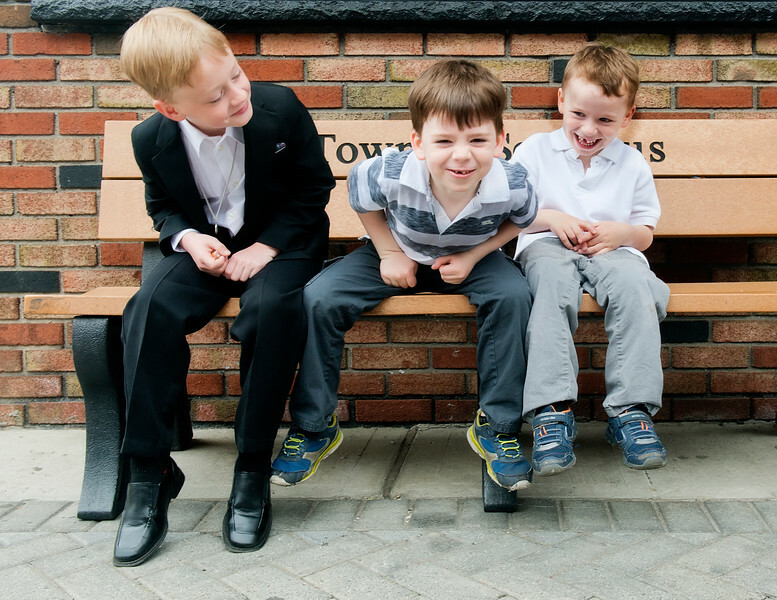 As it happens, that bench right outside of Blackjack Mulligans was the perfect spot to take umpteen million pictures of the First Holy Communion boy with all different conglomerations of his proud family. So I did, arranging him with everyone from his parents to his aunts and uncles to his friends. I was snapping away, concentrating on getting the perfect pictures of my subjects, and when I got home I loaded up the camera card on to my computer to see how I did. And pretty much every shot I took on that bench came out this way. 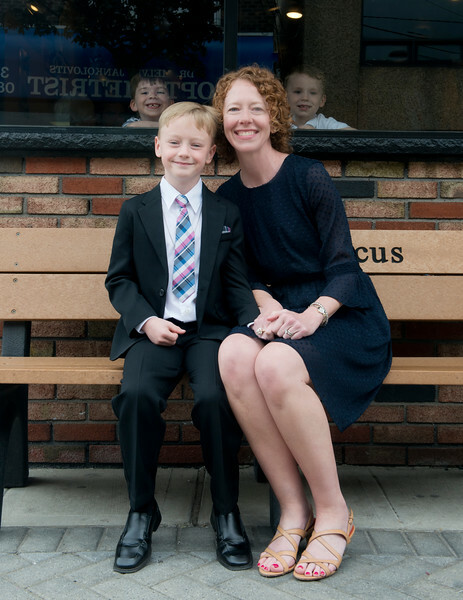 First Holy Communion Boy, happy relative (in this case his beautiful mama)…and check out the wee photo-bombers on either side of their heads. Yep. Perfectly placed in ALL the pictures. And you know what? I LOVE IT. Luck and circumstance and mischievous cousins = a bunch of pictures that perfectly capture the merriment of the day. I couldn’t be happier! Preheat oven to 425 and line a rimmed baking dish with foil. Spread artichoke hearts in a single layer, drizzle with olive oil, sprinkle with salt and roast until they start to get crispy edges, about 20 minutes. Meantime, heat a tablespoon of oil in a skillet over medium high heat and saute bok choy or spinach until just wilted, about 3-5 minutes. 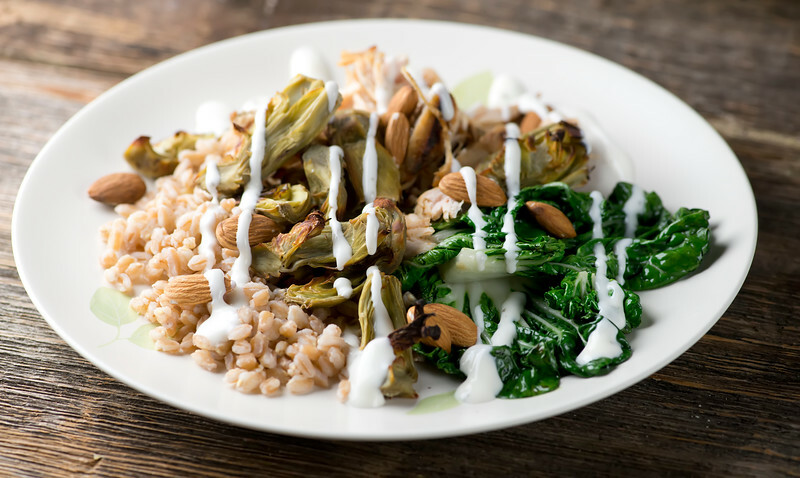 When the artichokes are ready, divide the farro or rice among four plates. Top with chicken, artichokes, boy choy or spinach and almonds. Drizzle dressing over the top and serve! This recipe is endlessly flexible – feel free to substitute different nuts, different dressings, etc! Love the story, the photos, and the recipe! Congrats to your nephew on his special day! I’ve been doing some leftover rescues this week myself. I made a big batch of quinoa and have dressed it up with some leftover pork loin and feta cheese. Added some chopped almonds and dried cranberries and a few garbanzo beans and drizzled it all with a blackberry balsamic vinegar. Quick and delicious. Will have to keep your version in mind for the next time we have chicken. Congrats to your nephew! I love the pics! Perfect capture of fun! Great recipe using up ingredients and not letting anything go to waste!